You think you might like to try this argyle thing, mostly because the prospect of pirate socks finally makes you think you can swing amidships from the peak halyard, eh? You think you know how to do it, you've located a few sets of directions, but still, you wonder, how exactly does an argyle sock look while you're knitting it? How will you know if you're doing it correctly? Boy, is this the post for you. Once you've calculated your gauge and figured out your chart (leaving an long tail for sewing up with later), and knit your ribbing flat (because you know that experiment where I tried a in-the-round ribbing before the flat part? Eaten by sharks. The traditional way still rules! 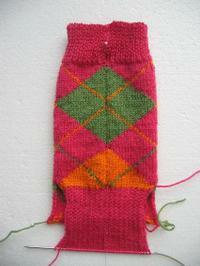 ), you knit the chart until you reach the point where you think you want your heel flap to begin. (psssst. You can see my little yarn gaps in this picture. I thought you'd be reassured to see that because it all gets sewn up in the end and no one's the wiser). Should I mention that you can at any point weave in those ends? The diagonals are a great place to tuck them if there's one handy. I recommend doing this as soon as possible if you're particularly squeemish about the end weaving. Otherwise, the whole thing can be a bit overwhelming all at once at the end, and I wouldn't want that. Fold the sock and sew up the seam with a ruthless mattress stitch. Do not cheat on your mattress stitch here. I know that you have cheated every other time you have used the mattress stitch because you have always gotten away with it. You will not get away with it here. Be tough and do it the right way. Pretend you're grafting. Pretend you're on a beach in Bermuda and you can only stay for as long as you are sewing the mattress stitch. If you stay long enough, the pool boy will bring you another Mai Tai. Okay. See right there, where the diagonals look wonky? Where their logical intersection gets eaten by the seam? Don't do that. When you make your chart, add a selvedge stitch on either side and your sock won't look wonky like mine does. knit a normal heel flap. 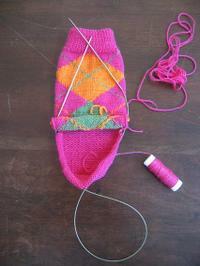 Turn the heel and pick up the gusset stitches on one side. Turn. You are looking at the wrong side of the work. Knit the first two stitches together to get a left slanting decrease, and continue back and forth, decreasing at the beginning of every row, until the gusset is as long as the instep you have already finished knitting. Note that because you are knitting back and forth, that this is a opportunity to finally be able to use that reinforcing thread that comes in your sock yarn on the entire area of wear under that merciless heel of yours. I pick it up in with the center twenty stitches or so, and leave it behind as I continue up the sides of the gussets. You'll see what I mean when you try it. View from the front . . . 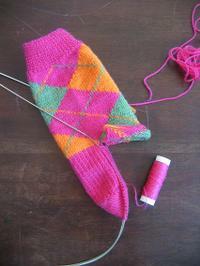 When they match, put all the stitches on your needles and proceed in the round as if it were any other sock. At any point in the knitting from now on, you can go back and sew up those little peek-a-boo openings. Again, be ruthless. Doesn't seem so bad, does it? Now, where's that halyard pool boy? I really do love you. You make a heel flap look almost bearable. But that doesn't look like three inches of ribbing to me. Doesn't "3 inches of ribbing" sound unspeakably filthy? Have I ever mentioned that I actually really like the mattress stitch part? Oh sure, not as much as Mai Tai and the pool boy or anything, but it's kind of....dare I say it?....fun. Or maybe it's Zen. Or something. Very well done. I admire your gift for clear photo illustrations and easy-to-understand directions -- and your modesty in admitting and showing your errors. All that adds up to an excellent teacher! Nice work. Holy crap, what have you gotten us into? Three inces of ribbing? I don't think so. Are you dicking with me? I'm a little dizzy with all the stopping and turning. But as soon as the motion sickness passes I'm sure I'll still want to try this argyle thing. Great info! Thanks for both the tutorial and the fantastic pattern. I am totally digging this argyle tutorial. I have another question: Is it possible to continue the last diamond down onto the heel flap? Thanks again for doing all the work to document this! I realy like this tutorial! I'm printing it off as I write this. Woot! Aaaargyles ahoy! So glad I didn't sign up for this insanity. Let's go back to that post where everyone was like, ME ME ME!!! Not me. Fantastic! Now, do you have the modifications for the toe-up, two-at-a-time version? Thank you so very much for providing all the information that you have on your ARRRRgyles. It has been very helpful and I'm definitely going to have to give it a try! Hmmmm...ARRRRGyle sockes, eh? I've never had much interest in knitting argyle until now - it must be the pirate thing. It always looked too hard. Thanks for making it seem approachable (and just in time for Pirates II as well: excellent timing!). I finally got my yarn and I am designing my argyle sweater.I am thinking of knitting it in the round only the chest area will be argyle doue to a colour shortage (whaahh!) and a single argyle down the sleeves. Your opinion , oh mighty Mistress of all things croocked plaid (as my grammy used to call it), can a sweater safely be knit in the round? I am thinking of about 3 rows of diamonds in the bust region. My mother corrected me it's "Drunken Plaid" not crooked. Great tutorial. I love, love, love those socks! This is gonna make a very cool armband on my black pullover! Very nice tutorial. Well done. Brilliant photos. You rock! you rock. this makes this much simpler for me because i could not imagine knitting argyle in the round. but now i can do it. yay! er um ARRGH!! Excellent tutorial! I love your pirate design and plan to use it in the next pair of argyles I knit. 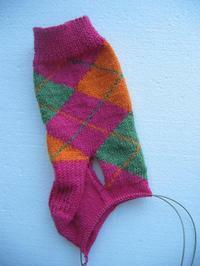 For those wanting a complete, working argyle sock pattern, check out the patterns at www.grkp.com. While the Grace Ennis designs and colors are straight out of the 1950s, her patterns are well written and her argyle charts are excellent and easy to work from. The charts have numbers to show the number of stitches to be knit in each color -- so you don't have to count squares.